The stone is actually set from underneath and held in place by the round bit of the ring and, indeed, by pressure from your finger when you wear it. So, you don't need to worry about the stone falling out. (so I call it a 'no tension' setting). 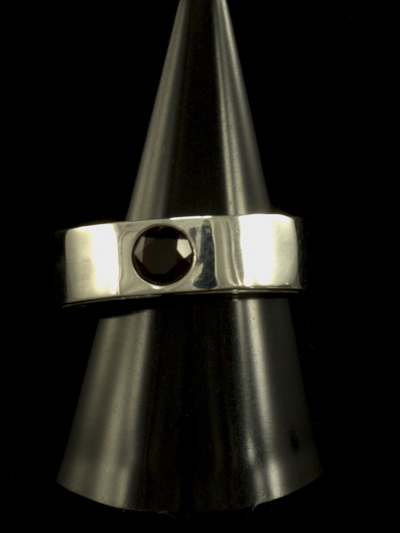 The stone is a 5mm round garnet. Garnets are not the most brilliant or sparkly of stones, so don't expect a flashing laser display, but you will see light coming through the stone very nicely giving lighter shades of ruby red in the classic dark blood-red of the garnet. The tension set ring is a modern classic if you want a sleek ring but want to show off a nicely cut stone because it allows so much light to pass through it. The problem, though, is that the ring has to be quite chunky and/or be made of a sufficiently hard metal for it to be tough enough to hold enough tension to retain the stone through knocks, bangs and years. Platinum and titanium are fine, but have you seen the price of them! And they are a little specialized to work with (though if you really want one, I can recommend an excellent maker). Not to be put off, I began to sketch some ideas for alternative designs that I could make in silver but would still let the light through and have that sleek look of a tension set ring. This is what I came up with. From the top, it looks like the stone has been mounted with a rub-over/gypsy setting - another classic, uncluttered design. But it's not.